Thus screams the headline on www.bigfootbag.com, where PortaQuip LLC of Loveland, Colo., promotes its new gear-transport product, a giant cargo bag of sorts that appears akin to the world’s largest bean burrito. But underneath the oddity, beyond the company’s enthusiastic hyperbole, the BigFoot Gear Bag is a cool idea. 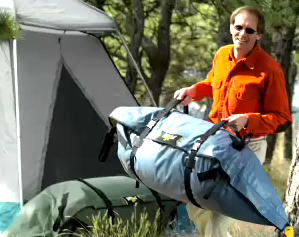 Essentially a huge duffle bag, this polyester container unfolds and lays flat on the ground. You toss gear inside—boots, tents, sleeping bags, helmets, life jackets, even backpacks fully loaded—and then zip up the container, sealing the gear inside. 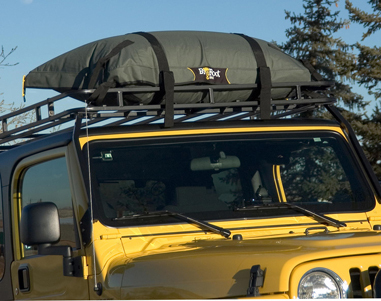 Polypropylene cinch straps, a heavy-toothed zipper, and webbing handles let you secure the package and carry it to a vehicle trunk or truck bed. For car camping, a family might throw in a weekend’s worth of equipment, carrying their BigFoot from a vehicle to a site to facilitate a quick camp setup. Or, some airlines will let you travel with this bag, though hauling it through the airport may require a cart rental. 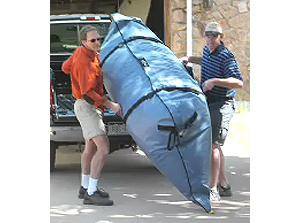 Generally, it takes two people to move a BigFoot bag, each person grasping a handle at opposite ends. They’re made mostly for short-distance transport, from the house to the car, or from the cabin to the dock. In my tests, the Medium Gear Bag made hauling a tremendous amount of equipment a faster task. It’s perfect for car trips and summertime camping weekends where loading and unloading dozens of smaller packages is a pain. 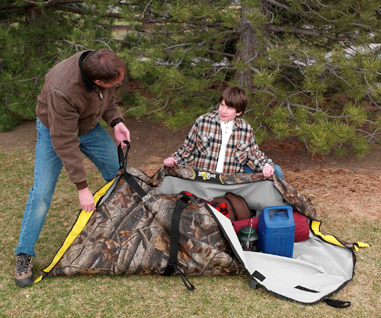 BigFoot bags come in Large (118×96 inches), Medium (86×72), and Small (57×52), with prices starting at about $45 for the smallest models, and ranging to near $90 for the big ones. Models are available specifically for boating, hunting and fishing, camping, and general use. The company employs various fabrics and color schemes depending on the bag. The Gear Bag model, for example, is made of a thick polyester with a vinyl coating, whereas the Cargo Bag model has a UV-resistant and slippery vinyl face fabric. One warning: The Gear Bag is weather resistant, though not 100 percent waterproof. Stowing it on a rooftop rack and driving through a rainstorm would be a bad idea. Otherwise, I found few gripes with this product. For what they are, the bags do seem a little pricey. But as a simple solution for managing equipment and clutter, there are few things I’ve found that do a better job.